Oops! I did it again. I think I have a new favorite vegan pizza recipe. Longtime readers will remember my first “new favorite vegan pizza recipe”: this delicious White Bean Pizza. Then less than a month ago, I blew that recipe out of the water with “my (new) new favorite vegan pizza recipe”: this even more delicious Roasted Pesto & Hummus Pizza. But now I’ve come up with something even more new and favorite: Guacamole Naan Pizza! Surprisingly, I got the idea for this pie not from one of the many food blogs I follow, but from the travel blog Uncornered Market, run by two amazing world travelers whom I happened to cross paths with while I was in Berlin in July. They recently published a post detailing the amazing Berlin “Gastro Rally” they got to experience—a whirlwind tour of Berlin’s food scene, as well as its history and culture. 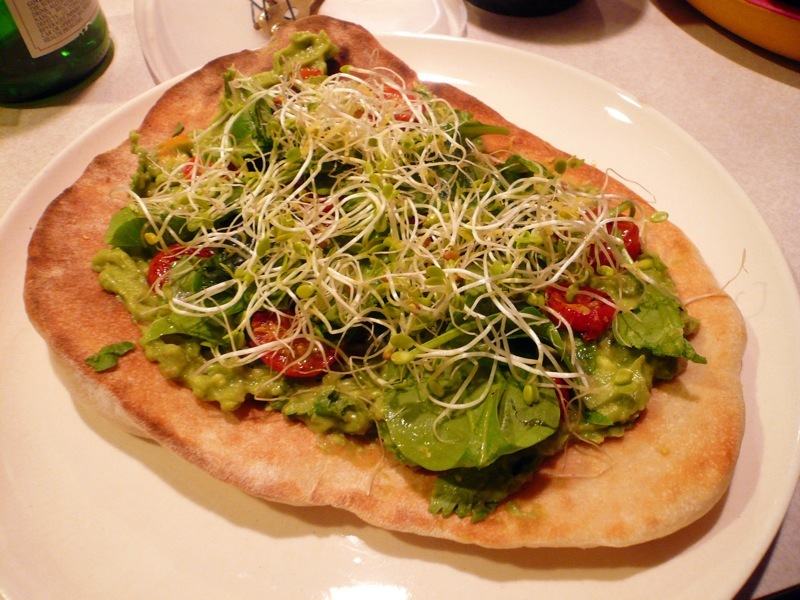 It’s a fantastic post, and you should really check it out for yourself, but the important point for our purposes is that one of the dishes they were served was a guacamole naan pizza—a delightful fusion dish I had never even imagined, much less heard of, before. After seeing it, though, I knew I had to make it—and stat. 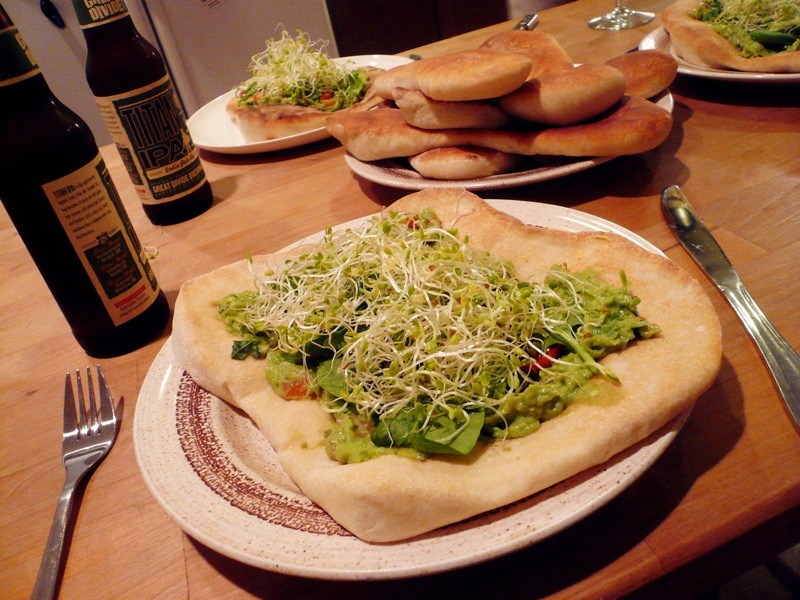 Mere days later, I did in fact make my own guacamole naan pizzas, for me and some friends. It was actually fairly easy, since I already had some experience with the pie’s different components. First, for the naan, I used the naan recipe I always use, because it’s the best naan recipe there is: this one from Manjula’s Kitchen (vegans: you’ll need to sub in soy yogurt for the regular stuff). This naan always comes out so good, and thankfully it still worked out rolled out into bigger pizza crust rounds. 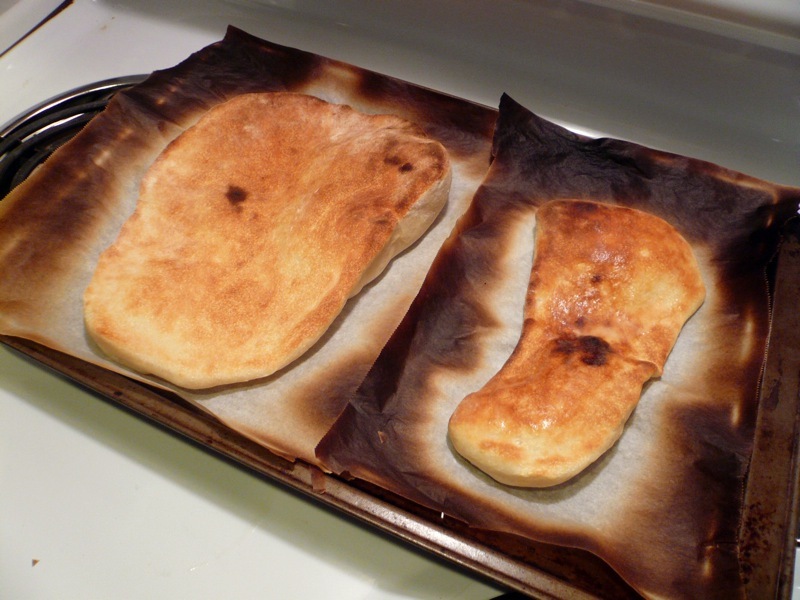 Here’s a couple of my naan breads right after they came out the oven; the one on the left is a future pizza crust, the one on the right is just a regular piece of naan. After that I simply whipped up some guacamole (Gena’s Classic Guacamole is always a good fallback recipe option if you don’t already have one you like to use), slathered that on the naan, and topped it off with some baby spinach, roasted cherry tomatoes, alfalfa sprouts, and some freshly squeezed lemon juice. The result: perfection. The only thing is—and this was something brought to my attention by my dinner guests—this isn’t really a pizza. And I guess that’s right: it’s more of a big piece of naan topped with guacamole and vegetables. However, being a veg*n for as long as I have, I’m pretty used to names never really fitting what I make (cashew ‘cheese’, anyone?). I cut this like a pizza, I ate this like a pizza, and regardless of what it tasted like, and regardless of its utter lack of any tomato sauce or cheese, it’s still a pizza in my mind. But enough talk—let’s just sit down and eat! Oh, and by the way: that Great Divide beer you see hanging out in the background there? It’s pretty great. Just sayin’. 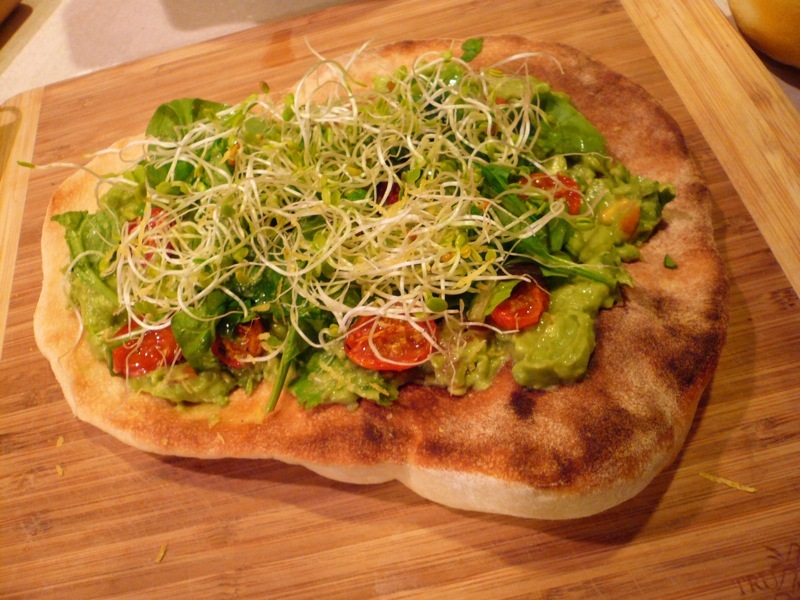 Now go make yourself some guacamole naan pizza! Naan is amazing, and guacamole is amazing, so this looks SUPER AMAZING!!! Mmm…. OMG this looks great — and you can totally call it a pizza. YUM.